Caring for your foal begins at conception and the correct worming approach is an important part of looking after the health of the pregnant mare. A mare’s natural resistance to worms may be lower during pregnancy therefore it is vital that they are monitored closely throughout the gestational period and wormed when necessary according to faecal egg counts. As with horses of all ages, treatment for encysted redworms should be administered during the winter months and a tapeworm treatment given in the autumn and spring. In addition, broodmares should routinely be wormed 2 – 4 weeks prior to foaling to ensure the mare is not carrying excessive worms and passing an increased volume of eggs in her droppings when the foal arrives. The eggs that the mare passes can develop on the pasture and result in a significant risk of infection for the foal. Treatment in the last month of gestation is also important as some worm larvae can be passed to the foal in the mare’s milk. Not all equine wormers are licensed for use in broodmares. Only a product that has been shown to be safe for the mare and the developing foal should be administered during this time. Foals are born parasite free with no immunity to parasitic infection. Worm burdens can lead to permanent damage and foals are especially vulnerable. Therefore, it is essential that a correct and safe worming approach is in place to protect the foal. The importance of different gastrointestinal parasites varies with a horse’s age, the time of year and the parasites migratory pathway within the horse. For young stock, there are several important parasites that need to be considered when designing worming regimes. Ascarids are the major threat to foal health. They can cause stunted growth, airway inflammation, but most importantly the adult worms can result in blockage of the intestines leading to severe colic. Small redworms are considered one of the most important equine parasites worldwide. The larval stages of the redworm can encyst within the wall of the intestine and their emergence, usually in the spring, leads to severe intestinal damage. Younger animals are less immune to infection and throughout the season adults and older foals will be shedding eggs, leading to an increasing level of pasture contamination. Similarly foals will be exposed to large strongyles and tapeworms during their first grazing season. Good pasture management with regular ‘poo picking’ helps to reduce the risks. Faecal egg counts should not be relied on in foals, as foals can harbor significant burdens of parasitic larvae that have not yet developed into egg laying adults. Foals are also sensitive to wormer overdosing, due to their relatively low amount of body fat, so make sure that you accurately assess their weight before each dose to ensure the correct amount is administered. 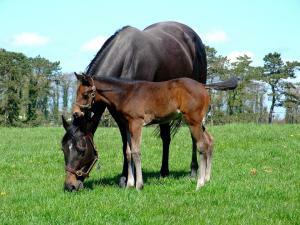 Take direction - Ask your Vet or SQP about wormers that are safe for broodmares and foals. Some wormers such as ivermectin/praziquantal combinations are licensed from as early as 2 weeks of age, whilst moxidectin/praziquantal must not be used until a foal is at least 6 months old. Give the correct dose – Bear in mind that a foal’s weight changes rapidly. Whilst it is important to avoid overdosing, administering a low dose can affect the efficacy of the product and contribute to the rapid development of resistant worms. Delivery - Make sure that your foal actually receives the required wormer dose, wormer that ends up on the floor is not only a waste and toxic to other animals such as dogs, it also results in under dosing.